Born to a well-to-do family in New Orleans, Paul Morphy became quite a strong player (thanks largely to the fact that his father – a Judge who also served in the House of Representatives from 1825-1829 – was an avid chess fan) by the age of eight. His uncle Ernest, known as the “Chess King of New Orleans,” played the young Paul often, and this undoubtedly had a major impact on his nephew’s quick rise in strength. In fact, Paul became so strong that he was able to blindfold himself and still beat Ernest (who had full sight of the board) at the age of twelve! In 1850 Paul got his first real test when the visiting Hungarian master, Johann Lowenthal, paid a visit to the Morphy household. There can’t be any doubt that Lowenthal thought the thirteen year old would be “easy pickings,” so one can imagine his surprise and humiliation when the child beat him 2 ½ - ½ (some sources claim the score to be 3-0). Paul wasn’t only skilled at chess, he also excelled in his academic pursuits and, by the tender age of nineteen, he had earned his law degree and admission to the bar (he had memorized the entire Civil code of Louisiana!). Unfortunately, Morphy’s scholastic success was a bit too quick for his own good – it wasn’t legal to practice law at that age. With time to kill, he decided to travel and play chess. His victory at the First Congress (which included all the finest players in the United States) brought him many fans, and his match win over Charles H. Stanley – one of America’s strongest – so shocked chess aficionados everywhere that they begged Morphy to go to Europe and challenge the very best (Morphy, giving Stanley pawn and move odds, won four straight before his embarrassed opponent conceded). The Englishman Staunton, in particular, was his main “target” as he was considered to be the unofficial world champion at that time. Arriving in England in June of 1858, Morphy quickly crushed all the best players there (Staunton, realizing that he would be wiped out, refused to play by offering a never-ending list of excuses.). The highlight was a match against the Rev. John Owen, one of England’s very best. Giving Owen pawn and move odds, Morphy smashed him 5-0 with two draws. Moving on to Paris, he crossed swords with the very strong Daniel Harrwitz. After losing the first two games (it’s said that he had a bad cold), the American came back strong, winning the next five in a row (with one draw). This 5-2 match victory set up a highly anticipated contest against the great Adolf Anderssen, which ended in yet another triumph for Morphy by 7-2 with two draws. At this point in his life Morphy was, perhaps, the most famous person in the world (it’s been said that he enjoyed greater notoriety than the Beatles did in their heyday). Courted by royalty, politicians, and the “in” crowd, Paul was invited to endless functions, balls, dinners, operas, and who knows what else. Morphy had conquered virtually every top player in the world with the exception of Staunton, who simply avoided the American like the plague! Nevertheless, this author has never been impressed by Staunton’s games, and at this time Anderssen (who was still getting better while Staunton’s best days were past) was clearly Staunton’s superior. Thus, virtually everyone viewed Morphy as the champion of the world when he returned, the conquering hero, back to the United States in 1859. He made a couple more trips to Europe in the next few years and continued to dominate every player who sat before him. Then, in 1863, Morphy returned to New Orleans and gave up all serious chess. I wish I could report a happy continuation to this genius’ life, but that wasn’t the case. Viewed as a chess professional (though he stridently insisted that chess could never be a profession, and that it was merely a pleasurable game, not to be taken too seriously), his career in law never got off the ground. Depression followed, and when a woman refused his offer of marriage by telling him that he was “a mere chessplayer,” he retreated farther into isolation. In time he began to manifest symptoms of deep paranoia, and insisted that someone was trying to poison him and that others wanted to set fire to his clothing. At this point he would only eat food prepared by his mother and he had little to do with anyone other than family members and a small group of friends. 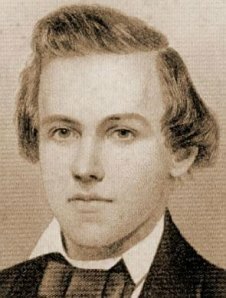 Though all this makes Paul Morphy sound as mad as a hatter, Steinitz visited him in 1883 and said, “Morphy is a most interesting man to talk to. He is shrewd and practical and apparently in excellent health.” Perhaps he wasn’t as cracked as one might have guessed (though Steinitz himself eventually ended up in a mental institution, which makes us wonder…), but one year later, on July 10th 1884, Morphy took a walk, got into a cold bath, and died. Here is one of Morphy's games. A weak move. The alternative is 5. Nf3 is preferable. This move does not help. He should have played 7. Be2. In order to play ...Nf5, increasing the pressure on White's Queen Pawn. Having developed with his customary rapidity, Morphy senses the possibilities along the c file. This allows Black to bring off a neat combination, but it can hardly be considered a blunder since White is lost in any event. On 13. Qd1 Black has several ways to win, the simplest being 13. .....Nc2+ and 14. .....Qxb2. White's Queen is trapped. Black has admirably exploited the resources of his superior position. Chess tactics are ways to make an immediate gain during plays, such as forks, pins, discovered check, and the skewer. A tactic may involve only a few moves, usually a combination of 2 to 4 moves. Strategy is the overall game plan. A strategy may start at the opening move and end at the last, or somewhere in between. A strategy usually leads to a massive material advantage or a checkmate. It is often in the middle game that planning becomes very important. It is usually in this stage when a move becomes critical and may lead to either a win or a loss. Choose moves that fit the game plan. The following game clearly shows that White has a plan, and Black has none. With the same provocative idea as the Alekhine's Defense. But White refuses to advance the e pawn. White can save his threatened Pawn by 8. Nxd7 Bxd7, 9. Bxd7 Qxd7. But this far-reaching simplification is neither attractive nor powerful, so he prefers something more adventurous. Black had a much safer alternative in 8. ..... a6, forcing some liquidation. Black doesn't bother to defend his threatened Rook. Black hopes for 14. Qxc8 Qe4+ -- which gives him a perpetual check. But of course nothing could be further from White's mind. A charming situation. On 15. ..... cxd4 or 15. .....Kd6 White wins the Black Queen with 16. Bf4+ while 15. .....Ke4 allows 16. Qxe6 mate. Black does not fancy 16. .....Kc4, 17. Qb3 mate. For after 17. .....Kxc4, 18. Qb3+ Kxd4 White wins the Black Queen with 19. Bb2+ or 19. Be3+. Black's lack of a plan led directly to a lost game. Frank James Marshall was the U.S. Chess Champion from 1909-1936, and was one of the world's strongest chess players in the early part of the 20th century. Marshall was born in New York City, and lived in Montreal, Canada from ages 8 to 19. He began playing chess at the age of 10 and by 1890 was one of the leading players in Montreal. He won the U.S. chess championship in 1904, but did not accept the title because the then current U.S. champion, Harry Nelson Pillsbury, did not compete. Marshall finished fifth at the extremely strong St. Petersburg tournament in 1914, behind World Champion Lasker, future World Champions Capablanca and Alekhine, and former World Championship challenger Tarrasch, but ahead of the players who did not qualify for the final: Ossip Bernstein, Rubinstein, Nimzowitsch, Blackburne, Janowski, and Gunsberg. Marshall was best known for his great tactical skill. One aspect of this was the "Marshall swindle", where a trick would turn a lost game around. Andrew Soltis writes that, "In later years his prowess at rescuing the irretrievable took on magical proportions". Not so well known now, but appreciated in his day, was his endgame skill. Here 8. ..... Nxd5, leading to some simplification, would give Black an easier game. The move permits White to open the h file. This cannot be answered by 11. ..... g5 because of 12. h6! followed by 13. Qc2 winning a pawn. A reflex action to shield his King - but it is too late. White has two mating threats. Black parries one of the threats (17. Qf7 mate) but he is helpless against the other one. For after 17. .....Kxh8, 18. Qh7 mate. White has executed a dashing attack in a most attractive manner. The Bird's Opening is characterized by the move 1. f4. As White, it is employed as an innovation to the usual 1.e4, 1.d4, 1.c4, and 1.Nf3. These are the ones we see without fail at the tournament level. However, there are other systems lying in wait for those practitioners who will study, play, and create innovations that raise them up to a level of respectability and playability that transcends the club level. I suggest Bird's Opening (1.f4) as one of those opening systems. Sometimes reviled, often ignored, Bird's is an opening with possibility. The final combination in the following game has a curious motif: in order to force mate, White has to get his Queen out of the way. So a Queen sacrifice paves the way to victory. Both players are contesting the long diagonal. This allows Black to win a Pawn by 7. ..... Qh4+, 8. g3 Qe4, 9. Rg1 d4, 10. Na3 Qxe5. However, on further study of the position, we find that White can regain the Pawn favorably with 11. Nc4 Qf6, 12. exd4 cxd4, 13. Qg4 Nc6, 14. Bg2 e5, 15. Bxc6+ bxc6, 16. Qe2 attacking the King Pawns and threatening B x P as well. Parrying the above threat. But White still maintains a strong attacking position. Contemplating 17. Nf6 with a strong attack at g7. White has several winning lines now, but he would find the prettiest way. If 20. .....Nh5, there follows 21. Rxh5 Kg8, 22. Rh8+, Nxh8, 23. Nh6 mate. A most unusual finish. The whole key to White's successful attack lies in his far-sighted 7. fxe5! Trick moves and traps abound in chess. Some work splendidly if the opponent succumbs. Others recoil badly if they are avoided. Black's trap in the following game is a good one, as it promises optimum results with minimum risk. For opening tricks and traps, you may visit Chess Opening Tricks. White makes room for his King Knight at e2 as he does not want to block his King Bishop's diagonal. White threatens to win a piece with Bxc6. Black parries the threat, for after 8. Bxc6 bxc6, his King Bishop will be protected. White succumbed to temptation. He is unaware of the succeeding Two-Rook Sacrifice. Threatening 13. .....Qxe2 mate as well as 13......Qxh1+ and mate the following move. If White castles, the reply 13......Bh3 forces mate. Similarly, on 13. Kf1 there follows 13.....Qxe2, 14. Kg1 Bh3. Very neat finish. Black must have all these in mind when he played move 7. From the Indian Games Openings, the King's Indian Defense is one of the most popular. Being relatively easy to play, it is based on solid principles of development and counter attack and at the same time the complexity of the positions which arise, create spectacular combination and attacks. If White has four pawns at the center of the board during the opening, the variation is called the Four Pawns Attack. In the King's Indian Defense, White masses his pawns to the center. Black first develops its pieces, then tries to break White's center by means of various pawn advances. Black's game can easily become seriously cramped unless he is prepared to take vigorous measures. White can now maintain a fine game with Qd2 followed by 0-0-0. This foolhardy move was played to restraint Black from freeing his game with ....d5. The first point of Black's Pawn sacrifice. But the best is yet to be. This is what Black has been leading up to. It is clear that 14. Kxe3 will not do because of 14. ..... Bh6+, 15. f4 Bxf4+ with a winning attack for Black. After 14. cxb7 Qxd4!, the continuation might be 15. bxc8+ (not bxa8/Q Re8 dis ch, 16. Kg3 Nh5 mate) Rxc8. Now Black should win, as may be seen from the following variations: 16. Qa4 Rxf3 dis ch, 17. Kxf3 Rxc3+ winning White's Queen -- or 16. Kg3 Nh5+, 17. Kh3 Qd7+ with mate in the offing. White resigns as he is about to lose his Queen. José Raúl Capablanca was a Cuban chess player who was world chess champion from 1921 to 1927. One of the greatest chess players of the twentieth century, he was renowned for his exceptional end game skill and speed of play. Due to his achievements in the chess world, mastery over the board and his relatively simple style of play he was nicknamed the "Human Chess Machine". Capablanca learned chess at the age of four by watching his father play and in 1901, at the age of 12, he beat Juan Corzo, the Cuban champion. Capablanca was regarded as the most naturally talented chess player anyone had ever seen. He was educated in America, studied engineering at Columbia University and spent much of his free time playing masters at the Manhattan Chess Club in New York City, where he achieved a sensational win in a match against US Champion Frank Marshall crushing him by 8 wins to 1 with 14 draws in 1909 when he was 20 years old. Frank Marshall had unsuccessfully played Lasker in a World Championship match only two years earlier. Black should have assured his forces more freedom of action by playing 4. .....Bf5. With a view to 12. Qd3 and 13. Bg5, threatening 14. Bxf6 and 15. Qxh7 mate. A new threat: 15. d5 preparatory to 16. Bxf6 and 17. Qh7 mate. Stopping the threat but weakens the castled position. Now the threat of Rxe6! is in the air. But not 16. ....Nf4, 17. Bxf4 Bxf4, 18. Rxe6!. The weakening of Black's King-side is beginning to tell. After 18...... fxe6, 19. Qxg6+ Kh8, 20. Qxh6+ Kg8, 21. Qg6+ Kh8, 22. Re1 White wins easily by bringing his remaining Rook to the third rank. Now, if 18. .....Bxe5, 19. Qh3! fxe6, 20. Qxh6+ and wins. Black resigns, for after 20. ..... Rxf7 White has 21. Qxg6 mate. Note that White removed all of Black's King-side pawns by sacrifices. The Queen's Gambit is a variation of the Queen's Pawn Game (1. d4), and characterized by the opening moves 1. d4 d5, 2. c4. The Bishop's Pawn is the gambit, being offered in exchanged for control of the center. White's aim is eventually to create a pawn center at d4 and e4, coupled with pressure on the Q-side using the QB-file. Black must either accept the gambit (Queen's Gambit Accepted), resort to a speculative counter-gambit, or protect his QP with a pawn (Queen's Gambit Declined) - if he makes an immediate developing move White gains an advantage. In most lines Black declines the pawn (although the Gambit Accepted (2...dxc4) is not unpopular), whereupon White seeks a Q-side minority attack. The usual continuation is now 9. Bxe7 Qxe7, 10. Nxd5 exd5, 11. dxc5 Nxc5 - whereby Black has freedom of action in return for an isolated Queen Pawn which may come under pressure from White's pieces. Now it is possible for Black to transpose into the previous note with 9. .....exd5, 10. Bxe7 etc. Instead, he varies. A successful attempt to entrap Black, who should resist sturdily with 10. .....Be7. Completely unexpected by Black. It is now too late for him to retreat his Queen, for then 12. hxg5 (threatening Qxh7 mate) leaves White a piece ahead. This looks like a clever maneuver, for after 12. hxg5 Black has 12. .....b3 discovered check driving White's Queen off the critical diagonal. Then, after 13. Qd2 or Qc3, Black can safely answer 13. .....Qxd5 and all is well. This is as far as Black calculated. But White saw farther ahead. One of the greatest surprise combinations ever perpetrated on an unsuspecting opponent. 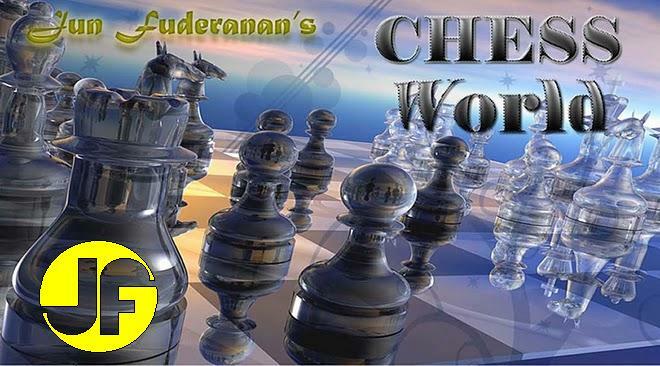 Do you want a chess game in your mobile phone? You may visit Mobile Phone Software. Classified as an irregular defense, this opening is also known as Center Counter Game or Scandinavian Defense, having been analyzed by Scandinavian players in the 19th century. Black's challenging 1..P-Q4 reply to White's 1. e4 aims to open up the center (usually with the combined early development of Black's queen) preventing positional play, but should present no severe opening problems for the competent White player. The following game is also known as the Peruvian Immortal Game. Excessive caution. It is a good idea to develop a piece, say 4. ... Nf6. One should not exchange a Bishop for a Knight so readily. Aside from that, Black brings the White Queen into active play. Black carelessly relies on what he thinks is a foolproof pin. It seems, superficially, that 11 axb4 would be too costly for White. Exquisite! Only a chess master sees the beauty of this move in a trice, and evaluated several moves ahead. Beautiful! It is instructive to go back over the game to see how Black unwittingly forced White to go into this combination. Do you want chess in your mobile phone? Visit Free Mobile Phone Software. Alekhine's Defense was named after Alexander Alekhine, who introduced it in the 1921 Budapest Tournament. It begins with the opening 1. e4, Nf6. This opening runs counter to the tenets of the classical school, allowing the Knight to be driven away about the board in the early stages of the game, in the expectation that White will create a weakness in its central pawn structure. White's imposing mass of pawns in the centre often includes pawns on c4, d4, e5, and f4. Grandmaster Nick de Firmian observes, "The game immediately loses any sense of symmetry or balance, which makes the opening a good choice for aggressive fighting players." In the opinion of the author, this is the best way to solidify White's central pawn structure. Black plan is to undermine White King's Pawn with .....c5, but it does not take account the possible tactical complications. Black should have castled first at this point to safeguard the King against unpleasant eventualities. Comparatively best for Black now is 9. ..... Bxe5, 10. Bxc5 etc., although the prospects for his Knights would have been rather poor. Black is too ambitious; he wants to win White's King Pawn without parting with his own Queen Bishop Pawn. White immediately seizes on the opportunity to create favorable complications. For if Black captures the Bishop, White replies with 15. Qd8 mate. Black has been made to pay a heavy price for his faulty plunge into tactical complications before safeguarding his King. followed by 3.Nc3 (the Modern Variation), 3.Nd2 (the Classical Variation), 3.exd5 (the Exchange Variation), or 3.e5 (the Advance Variation). 2.Nc3 is the modern variation which has gained much popularity. The Caro-Kann, like the Sicilian Defense and French Defense, is classified as a "Semi-Open Game", but it is thought to be more solid and less dynamic than either of those openings. It often leads to good endgames for Black, who has the better pawn structure. Waste of time. 4. exd5 is much better. This is the losing move. White loses time and gives Black attacking momentum. White resigns. He is unable to move any of his major pieces. Black's immediate threat is .....Bg7 winning a Rook. The most likely line of play is therefore 13. d4 Bg7, 14. Kd2 Bh6+, 15. Ke2 Nf6, 16. g3 0-0, 17. Kf3 R8c8, 18. Kg2 R8c2 and Black has a very easy win. Black took drastic advantage of the opportunities offered him. Strangulation happens when the enemy King is lost, and checked whenever he goes. Strangulation is different from zugswang, a German term referring to a position that would be tenable if one could keep all one's pieces where they currently stand, but is lost because one of them must vacate its position. In plain English, "If you move, you die." Here, 6.....e6 is perfectly acceptable. This retreat is incomprehensible as 7. .....e6 still leaves Black with a playable game. White has set an amusing trap: if Black plays the plausible 9. .....Bg7? there follows 10. Nxc6 bxc6, 11. Bxe7 and Black's Queen is lost. Likewise, after 9. .....h6, 10. Bh4 g5 we get 11. Ne6! fxe6, 12. Bh5 mate or 11. ..... Qa5, 12. Qxa5 Nxa5, 13. N5c7 mate. Black has no other move but 13. .....Kg8. White initiates mate by 14. Bc4+. An extraordinary finish. Tired? Do you have a mobile phone? Visit Free Mobile Phone Software. The Sicilian Defense ranks as one of the richest openings in the world of chess in terms of variations. So many chess scholars have written on the subject and thousands of books were published. The defense is characterized by the opening moves 1. e4, c5. Black's move is the most popular and best-scoring response to White's 1. e4. Grandmaster John Nunn notes that the reason for the Sicilian Defence’s popularity "is its combative nature; in many lines Black is playing not just for equality, but for the advantage. The drawback is that White often obtains an early initiative, so Black has to take care not to fall victim to a quick attack." By advancing the c-pawn two squares, Black asserts control over the d4-square and begins the fight for the centre of the board. The move resembles 1…e5, the next most common response to 1.e4, in that respect. Unlike 1...e5, however, 1...c5 breaks the symmetry of the position, which strongly influences both players' future actions. White, having pushed a kingside pawn, tends to hold the initiative on that side of the board. Black seems blissfully unaware of the explosive potentialities of the position. A hidden point is that after 11. ..... Nxd5, 12. exd5 Ne5 Black's Queen can be driven off: 13. b3 Qc3, 14. Bd2 Qb2, 15. Nc7+ winning the a8 Rook. A difficult move to answer, for if 12. ..... gxf6, 13. Qh5+ Kxe6, 14. Qe8+ with a mating attack. Or 12. .....Nxf6, 13. b3 Qb5, 14. N6c7 and wins. And now the powerful threat of Qf3-f5 mate wins more material. The Knight has a charmed life. If 16. .....b6, 17. Nxb6 Qxb6, 18. Qg4+, followed by 19. Qxc8. Threatening a5, assuring the Knight's escape. And now if 19. .....Bb7, 20. Rc3 Qxd5, 21. Nxb6+ wins for White. White has the last laugh. If 20. ..... Qxb6, 21. Qf5+ Kc7, 22. Rc3+ wins; or if 20. ..... Bxb6, 21. Qf7 Kd8, 22. Qxf6 winning the Rook. An enchanting finale. Tired? Do you have a mobile phone? Take a break. Visit Free Mobile Phone Software. The French Defense is characterized by the opening moves 1. e4, e6. The French has a reputation for solidity and resilience, though it can result in a somewhat cramped game for Black in the early stages. Black often gains counterattacking possibilities on the queenside while White tends to concentrate on the kingside. One of the most interesting facets of a great master's art is his knack of demolishing positions which seem overwhelming. In the following game, Black must have the keenest of insight to convince himself that White's imposing-looking position was really hollow. Black will try to undermine White's powerful-looking Pawn center with ....c5 and .....f6. White will support his pawn center with c3 and f4. This explains his next move, which is a preparation for f4 and c3. White hopes to play Bg2 but never quite got to it. White's support of his center gets his pieces entangled; Black's attack on the center opens up lines for him. The best reply to this is 12. Nc3. White's reply leads to quick trouble. Interesting enough this matter-of-fact move threatens .....Nxe5 as both White's Queen Pawn and King Knight are pinned. The unexpected start of a dynamic breakthrough. Leaving White very little choice, for on 16. Kf2 the reply 16. .....Ng4+ is deadly. For example: 17. Kf3 Qxe3+; 18. Kxg4 e5+ with mate next move. Conclusive, but an attractive alternative line was 16. .....g5+! and if 17. Kxe5 Bd6, 18. Kf6 Qd8 mate! A pretty alternative was 17. Bd4 Qf8+, 18. Ke3 Qf3 mate. And here 17. .....Qf8 also does the trick. White resigns, just in time to avoid 19. Kg5 Qe7+, 20. Kh5 Be8 mate. Most scholars believe that the Romantic Era began in 1798 and ended with the coronation of Queen Victoria in 1837, and the beginning of the Victorian Period. The Romantic movement which was so influential, also left its mark on chess. The games of this period are full of forceful attacks and slashing sacrifices. The following game is one of the masterpieces of the period. Waste of time. Simply 5. 0-0 Nf6, 6. e5 was in order. A formidable counter. On 7. exf6 dxc4 Black has a fine game. Now the Bishop is buried alive, whereas the Black Knight performs great deeds. On 9. fxg4 Qh4+, 10. Ke2 Qf2+, 11. Kd3 Nc5 mate or 10. g3 Nxg3, 11. hxg3 Qxh1 with a winning attack for Black. On 14. Rxg5 hxg4, 15. Rh5 Rxh5 mate. With the piquant threat 15......Qf1, 16. Qxf1 Rxh5 mate. Black has a forced mate: 19 Kh2 Bg1+!, 20. Kh1 Bf2+, 21. Kh2 Qg1 mate. In a chess blog full of Queen sacrifices, the Queen sacrifice in the following game is truly remarkable. In fact, the whole game is off the beaten track. The old Berlin Defense, rarely seen nowadays. The alternative 5. d4 is more likely to create difficulty for Black. Of course not 6. .... Nxb5, 7. Nxc6 dis ch winning Black's Queen. Here Black has an easier game with 9. .....Nxe5, 10. dxe5 d6. Feeble. Much better was 12.....Bf5 then Be4. Instead of effectively centralizing his Queen Bishop, Black has badly posted his Knights. White intends to increase pressure with Qh3, but Black's next move offers a stunning inspiration. One of the deepest surprise moves ever played. Had Black dreamed of what was coming, he would have tried 17. .... Ncxe5. The expendable Queen. After 18. ....fxg6 there follows 19. Bxc4+ Kf8, 20. Nxg6+ hxg6, 21. Rh8 mate. Black cannot stop mate. Truly an unconventional game. In chess as in war, an opponent taken by surprise is half defeated. The following game emphasizes the case, giving us the insidious notion that third-rate surprise moves are "better" than first-rate logical moves. This cynical concept adds to the charm of chess. So far, so good. Everything has proceeded along well-trodden paths. But this comes as a complete surprise (instead of the conventional 7. Bb3), played to rattle Black. The Knight moves are wasting too much time. With 8. ...f5 or even 8. ...bxa4 Black would have had a safe game. Black cannot capture White's Bishop because of the tricky continuation 10. Qf3! (threatens mate) f6, 11. Qh5+ g6, 12. Nxg6 hxg6, 13. Qxg6 mate. The obnoxious Knight is driven away, only to go to an even more troublesome spot. The Knight has become a "rusty nail in the knee". The terrible pin is reinforced. If Black tries 11....f6, 12. Bxf6 gxf6, 13. Qh5 mate. Or 13. ...Bxe7, 14. Rxe7+ Kf8, 15. Bb3 and White is a piece to the good. Black realizes that after 15. ...Rhxf8 White will continue 16. Ne5+ winning a piece. White's crafty plan of creating confusion in Black's ranks has paid off handsomely. The Ruy Lopez opening dates from a work known as the Gottinberg Manuscript, written in Latin in 1500 by Lucena. Ruy Lopez, a Spanish priest, later wrote about the opening in a book which was published in 1561, so the opening was named after him. The Ruy Lopez, also called the Spanish Opening or Spanish Game, is a chess opening characterized by the moves 1. e4 e5, 2. Nf3 Nc6, 3. Bb5 .... The Ruy Lopez opening is one of the oldest and most studied openings in the realm of chess. So many books have been written on the subject, not to mention the thousands of articles about it found in the Internet. This author will not expound on the opening itself, but will emphasize on the importance of having a sound pawn structure. "The pawns," said the great Philidor, "are the soul of the game." In the following game, a weakness in Black's pawn structure leads to the direst of consequences. Black's last move is not recommended. It has the possible drawback of leading to a weakness in pawn structure. After this move, Black's pawn structure is in a shaky state. This is particularly true of the b3-g8 diagonal. The safer course for Black is 13. .... Qd7. This surprise move underline's Black's troubles on the weakened diagonal. Observe that the d5 pawn is pinned. Black must lose some material. For example, if he plays 14. ....Bxe4 White replies 15. Nxe4 and Black's d5 pawn must go. In that case, the reply to 15. ....Nxe4 would be 16. Bxd5+ Kh8, 17. Bxc6 and White wins at least the Exchange. To this Black's relatively best reply is 15. ....Qxd5, 16. Bxd5 Kh8 but after 17. Nxe4 White would have achieved his objective: winning the weakened d5 pawn. Avoiding this, Black falls into something much worse. One must admit the single-mindedness with which White exploited the weakness in Black's pawn structure. The Four Knights' Game, as the name suggests, is characterized by the early deployment of knights on both sides of the board. Here, we have a game that also emphasizes the importance of having two bishops working side by side against the enemy King. Few forces in chess are more powerful than two smoothly coordinating Bishops. Some players think that a Bishop is just equivalent to a Knight. Maybe. But two Bishops are much more powerful than two Knights working in tandem. Here is a game that illustrates that principle. In the event of 5. Nxe5 in reply to his last move, Black would continue 5. ......Qe7, 6. f4 Nxb5, 7. Nxb5 d6 with a good game. A tricky move. If White plays 7. Bxf7 he will come out with a piece down after 7. .....Kd8. And on 7. Nxf7 d5!, 8. Nxh8 dxc4 Black will eventually confiscate the wayward Knight. White condemns the Knight to uselessness and also blocks his Queen Pawn, and consequently the development of his Queen Bishop. Surely 7. Nf3 was in order. After 8. Nxc5 dxc4! White's advanced Knight would be in a bad way. In return for his sacrificed Pawn Black is achieving a magnificent development. The energetic text move prepares for .... Bb7. By threatening mate at h2 Black forces a weakening of White's kingside pawn structure. This enhances the long-range striking power of the Black Bishops. The coming devastation at h file must be decisive. Black threatens hxg3 with immediate disaster for White. White can try to avoid this by putting up a defense along the second rank. but even this is doomed to failure. For example: 16. f3 hxg3, 17. Qe2 gxh2, 18. Kh1 Nh5!, 19. Nf5+ Kf8, 20. Rf2 Re8, 21. Qf1 Rxe1, 22. Qxe1 Qxf3!, 23. Rxf3 Bxf3 mate. White resigns, for after 17. Kxh2 hxg3 dbl ch, 18. Kg1 Rh1 mate. Note the artful way in which Black combined the power of both Bishops to control the board diagonals. The Scotch Game or Scotch Gambit is a chess opening that begins with the moves 1. e4 e5, 2. Nf3 Nc6, 3. d4 ..... The opening received its name from a correspondence match in 1824 between Edinburgh and London. Popular in the 19th century, the Scotch had lost favor among top players because it was thought to release the central tension too early and allow Black to equalize without difficulty. More recently the Scotch has regained some popularity and it has been used by grandmasters Kasparov and Timman as a surprise weapon to avoid the well-analyzed Ruy Lopez. White aims to dominate the center by exchanging his d-pawn for Black's e-pawn. Black usually plays 3...exd4, as he has no good way to maintain his pawn on e5 (this same position can be reached by transposition from the Centre Game 1.e4 e5, 2.d4 exd4, 3.Nf3 Nc6). After 3...d6, White is better after 4.dxe5 dxe5, 5.Qxd8+ Kxd8, 6.Bc4, or he may simply play 4.Bb5, when 4...exd4 5.Nxd4 Bd7 transposes to the Steinitz Defense to the Ruy Lopez. Wilhem Steinitz, famous as the man who elaborated the idea of playing for "small advantages", was so brilliant a player in his youth that he was dubbed the :Austrian Morphy. Here is one of his games. Stronger than 6. .... dxc3, which gives White a good initiative after 7. Nxc3 in return for the sacrificed pawn. Black does not fear the coming complications. Black hopes for an attack on the castled King. Here, 13. Bxg5 is a mistake: 13. .....Kh8; 14. h4 h6 and the Bishop is lost. Black reckons on 15. fxg4 Qh4 with a powerful initiative for his aggressively posted pieces. Or 16. Rg2 Ne1, 17. Rg1 Nc2 and Black wins. An unpleasant surprise. If 17. Rxh4 Rg1 mate. A dashing win by the Austrian Morphy. White's queenside pieces are still on their home squares -- typical of such games.